– Musings about friends, family, fitness, film, TV, Japan and travel destinations. Ask Linda Sherman was initially a Posterous blog launched January 9, 2009 to express my musings on various topics of interest to me. My first post was to announce that I was finally using my husband, Ray Gordon’s, last name with mine. My Posterous was initially named LindaShermanGordon.Posterous.com. Please note that all of the historic posts before the blog was reopened in 2014 did not have the opportunity to gain social proof counts. So while I have installed a bookmarking plug-in, and it shows on all posts now, the lack of counts there does not indicate a lack of popularity at the time. I first learned about Posterous September 19, 2008 when I attended a presentation by Guy Kawasaki at my first BlogWorld (now New Media Expo) conference. I already had a WordPress blog called ItsDifferent4Girls.com that I had launched February 2008 but I felt that every post there should be very deliberate and my Posterous could be more casual. Twitter was central to my social media life at the time and Posterous worked very well as a “Twitter extension.” As I posted new Posterous posts, I could simultaneously post them to Twitter as a post.ly. I liked the way my comments on Posterous could also be posted to Twitter as post.ly’s. I remained a Posterous fan. I interviewed Guy Kawasaki at SXSW in March 2010 about it. Ray Gordon is sometimes with me at conferences to shoot video, unfortunately he wasn’t here for this one so the video is a bit erratic … but I had my own camera and pro mike with me so the audio is good. 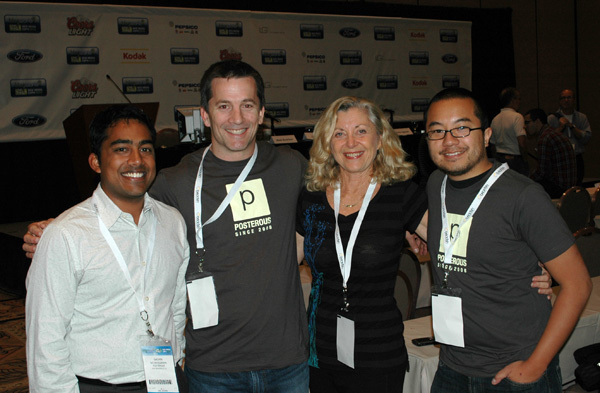 I had the pleasure of meeting up with executives from Posterous at several BlogWorld’s over the years. Posterous Executives with Linda Sherman October 15, 2010. Note the “since 2008” on their shirts. Posterous was sold to Twitter and shut down at the end of April 2013. If you would like to learn more about the transition from Posterous to WordPress, I have provided specific tips based on what I found out. 2014 on I will continue to use Ask Linda Sherman on WordPress as a casual and often opinionated blog.